helping the environment? We do too. At By Darash LLC we try to integrate sustainable, resource-efficient solutions throughout our designs as much as possible. This means also staying up to date on the most current trends, including the newest technologies, layout and design options, features and more. The kitchen and/or bathroom are ideal locations within your home or business to integrate green solutions because these are often the most resource intensive areas of the structure. Think about how much water can be saved through a new faucet or shower head; the possibility to reduce air conditioning needs through a layout that promotes a natural cross breeze; energy that can be reduced by a new stove or dishwasher. These are some of our goals for your project. Materials used in construction can create a huge resource footprint of the project as a whole. Through the use of sustainable materials, we can try to reduce this impact, and make your kitchen or bathroom better for the environment. One option is to use reclaimed or recycled materials such as countertops, cabinetry, tile and more. At the same time, we never compromise quality. Installing energy efficient appliances (ex. 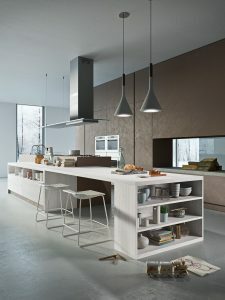 stoves, refrigerators) as well as water saving fixtures (ex. faucets, shower heads) are ideal way to increase the sustainability factor of your kitchen or bathroom. We help you to select options that flow beautifully with the design of your space, while simultaneously offering maximum function you would expect from top appliances and fixtures. Did you know you can improve the temperature within your home through natural, passive measures? During times of extreme weather (hot summers, cold winters) the layout of the home, as well as the placement (and choice) of windows and doors, can help to maximize air flow and minimize direct heat gains in summer or increase sun exposure and minimize cold air influx in winter. 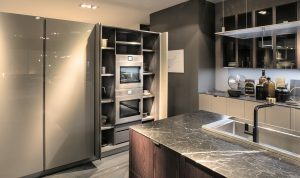 By Darash is a rapidly growing company committed to supplying beautiful, healthy, eco-friendly cabinetry and informing the public of the vast amount of choices available to them. Generally, many people are not yet aware of the tremendous options for healthy, beautiful custom cabinetry available for their kitchens and baths. It is essential to examine what to look for when selecting new cabinets to compliment and complete your green home. The most important factor in choosing environmentally and family-friendly cabinets relies on choosing a company that uses stains, finishes, and glues which are free of Volatile Organic Compounds or VOCs. According to the U.S. Department of Health and Human Services, domestic exposure to “VOCs can cause allergic reactions such as asthma, headaches, upper respiratory infections and rashes (and) even cancer.” VOC refers to “a class of chemicals which evaporates readily at room temperature. When these VOCs off-pass, they may cause a variety of health problems like nausea, dizziness, irritation of the eyes and respiratory tract, and more serious illnesses including heart, lung or kidney damage. Certain people are particularly susceptible to these effects, including those with weakened immune systems or chemical sensitivities, asthmatics, young children and the elderly. In addition, a recent joint case study suggests “domestic exposure to VOCs at levels below currently accepted recommendations may increase the risk of childhood asthma. Measurement of total VOCs may underestimate the risks associated with individual compounds VOCs are commonly found in pressed wood (wood chips glued together such as particle board or MDF) and include benzene, xylene, and urea formaldehyde. These compounds are in the glues which hold together particle board and are also found in paints and stains. As wood products begin to deteriorate they release the toxic gasses into the environment. Moreover, “urea formaldehyde procedures emissions that increase with temperature and humidity, which is worst in kitchens.” By Darash supplies polymer, painted, and lacquered cabinetry completely free of VOCs which means that none of their paints, stains, or finishes contain even “Low VOCs”. “Low-VOC (paints and finishes) may meet the EPA regulations, which call for no more then 250 gm/l (grams per liter) of VOCs in “Low VOC” latex paints and no more then 380 gm/l for “Low VOC”... However these limits are based primarily on reducing ozone formation in the outside air and not on health considerations for indoor air. The Green Building Program requires buildings rated by our program to use paints (and finishes) with no more then 150 gm/l of VOCs. especially for those with chemical sensitivities- is the use of zero or No-VOC paint (less then 1 gm/l per EPA Reference Test Method 24. )” By Darash sources building materials from the EU where requirements are automatically set at stricter levels then current American Emissions Standards. Our choices feature California Air Resource Board approved products that have also been recognized as CATAS Quality Award recipients. When the focus is on sustainability, By Darash supplies beautiful all wood cabinets manufactured of material certified by the FSC under parent company Gruppo Trombili since 2006. The FSC (Forest Stewardship Council) sets forth principles, criteria, and standards that span economic, social, and environmental concerns and their standards represent the world’s strongest system for guiding forest management toward sustainable outcomes. By Darash cabinets are available in an endless array of colors and materials to fit any and all tastes and budgets. The cabinets offer elegant, cost effective solutions to domestic requirements and innovative furnishing system designs which maximize work space and storage. With the growing enthusiasm for green building, it is important to install not only energy saving appliances and light fixtures, but also closely examine the paints and finishes on cabinetry which greatly affect the quality of the air we breathe in our homes. From By Darash, the choices are limitless. From the classics to the most modern in health conscious, sustainable materials and environmentally safe finishes. It is essential for homeowners to stay aware of the exciting, eco-friendly cabinet choices available from By Darash.